The radiator is the heart of any vehicle’s coolant system– it has one major job: keep the engine cool while in use. It may sound simple, but without the right type and amount of fluid circulating… your engine would overheat, seize up and leave you stranded. Radiators are almost entirely maintenance-free in modern vehicles, but they can wear down and develop problems. The longer and harder a radiator is used, the sooner and more serious your radiator issue could be. The following is a short list of typical symptoms of a failing coolant system. Overheating or a spiked temperature gauge are surefire signs that your coolant system needs professional attention. On some occasions, the damage to your radiator can cost so much to repair that it makes more sense to purchase a full replacement. 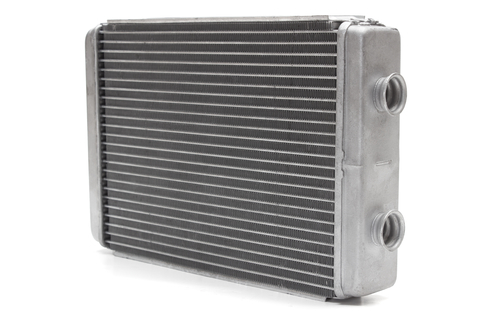 Whether used or new; aftermarket or original equipment manufacturer (OEM); replacing a radiator can be a considerable investment. Here are some examples of when to consider replacement: internal rusting/discoloured coolant, major blockages or leaks; overheating where the coolant evaporates. As you can see, there is a wide range of radiator issues with consequences ranging from inconvenient to extremely serious. If you suspect your vehicle has a faulty radiator or coolant system, do not hesitate to bring it to the professionals here at Park Muffler today! Our expert staff will help you make the right choice to get you back on the road.